PARK YOUR MOUSE over any line of text to view a modernized translation. There are only a few types of punctuation marks used here. There's a period (". "), a colon (":"), a comma that is printed like a slash ("/"), and a question mark that is printed rather like an upside down semi-colon — . You can see an example above, in the fourth line from the bottom -- "what he hath done?" Scripture is formatted into paragraphs, but notice that it is not divided into verses; it would be 20 more years before verse divisions were instututed. At the top of this page in the left margin is a capital letter "F", and halfway down that margin is the letter "G" (they're a little smeared and a trifle hard to read). In lieu of verses, chapters were divided into sections, and each section was given a letter. 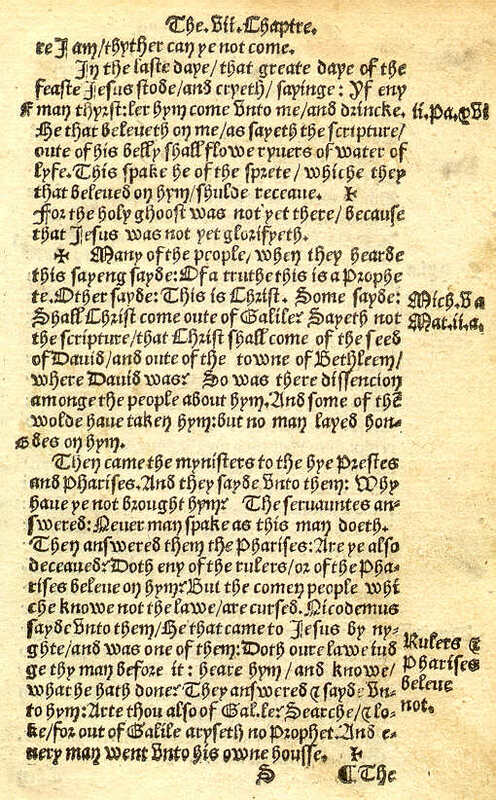 So at the time of Tyndale, the text on this page was called John 7:f-g. This was hardly a handy way to refer to Scripture, and it was quickly dropped once verse divisions came on the scene. Notice the note in the right margin at the bottom — "Rulers and Phasises believe not." Because everything on this page is in the same typeface, sometimes it's hard to distinguish between Tyndale's notes and the Bible text. If you are having trouble reading this page, that's understandable. Between the typeface and the spelling, it sure looks a lot different than today's English. If your browser is Internet Explorer, take your mouse and point to a line of text; a "modernized" translation of that line will pop up.